Corporate Funding Group, LLC announces new home development Old Cypress Pointe planned for Tequesta, FL on 11 acres of Waterfront property. The future Old Cypress Pointe homeowners will have the best of all worlds—a private setting in natural surroundings with proximity to ocean recreation, world-class shopping and an international airport. Real estate investment company, Corporate Funding Group, LLC, has announced the acquisition of an 11-acre tract of waterfront land in Tequesta for the development Old Cypress Pointe, a Treasure Coast luxury new home community with a difference. 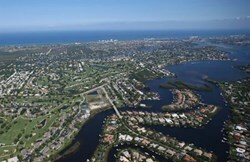 According to Frank Skelly, Jupiter, FL resident originally from New York and one of the primary investors in the property, the investment group envisions an intimate South Florida residential community with a small number of large home sites. "The opportunity to have a waterfront home built on an ample piece of property is extraordinarily rare in Florida," Skelly said. "The future Old Cypress Pointe homeowners will have the best of all worlds—a private setting in natural surroundings with proximity to ocean recreation, world-class shopping and an international airport." Located on the North Fork of the Loxahatchee River off of SE Island Way, Old Cypress Pointe will offer easy boat access to both the open waters of the Atlantic and the many dock side restaurants along the Intracoastal Waterway. Spacious home sites, a community lake, and the nearby Jonathan Dickinson State Park will provide abundant opportunities to enjoy nature. The area offers a charming small town feel, safety, and top-rated schools. Shoppers will enjoy being minutes from the Village of Tequesta's downtown area with its small shops and coffee houses and a short drive from plentiful shopping options including the Gardens Mall in Palm Beach Gardens, Whole Foods, and other luxury retail offerings. Old Cypress Pointe residents will also have their pick of several world-class golf courses. Better still, with Palm Beach International Airport just 30 minutes away, they will be able to live here and work or travel anywhere with ease. "Old Cypress Pointe will offer everything our future residents need to create their own signature lifestyle," said Skelly. For more information about Old Cypress Pointe visit: OldCypressPointe.com.